This post is co-authored between Adam Telfer and Michail Katkoff of Deconstructor Of Fun. Since Facebook fully embraced free-to-play, Crowdstar and others have strove to get to grips with what’s perhaps rather crudely been referred to as “female first” gaming – to make their name as a company that truly understands and delivers on an underserved demographic in the market. In practice, what this translated to was – at least initially – a series of “cute” style games; taking care of sweet animals, managing a farm packed full of farm animals with massive eyes, or dressing up games with way too much glitter and pink everywhere. It ended up with studio creating games for a stereotype: a fictitious and overly simplistic view of what might interest women, with very little understanding of the nuances the chosen demographic actually wanted. Worst still, not all too many developers successfully went much deeper than that, believing that focusing a title on cute animals with big eyes was how you made a games ‘female friendly’. 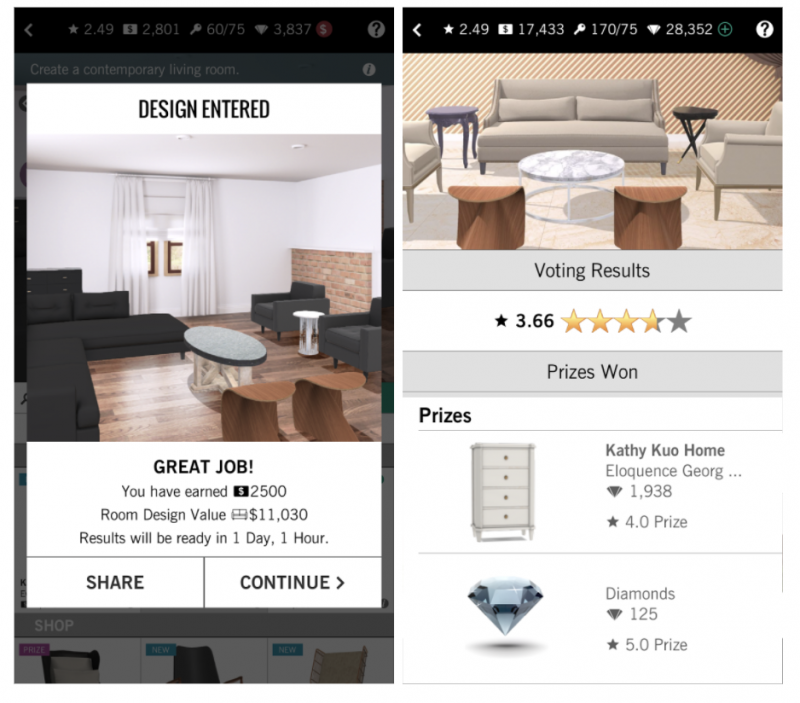 Crowdstar challenged that assumption with the creation of the Covet Fashion and Design Home games, and it paid off. The game is one of the first of its kind to truly create a social network-game hybrid that recreates the feeling of being a professional in fashion design and interior decoration. It’s also one of the few games to really deliver on the actual professions of interior design or fashion without feeling cutesy. Not only that, Crowdstar has managed to deliver a strong core loop built around equally strong principles of great F2P design – a core loop that, dare I say it, has never before been seen on the App Store. So, why was it so successful? Crowdstar was founded back in 2008, first focusing on free-to-play titles for Facebook Canvas before a shift to mobile in 2012. Crowdstar initially raised a $23 Million Series A in May 2011 on the back of the company’s success on Facebook success, raising an additional round of $11 Million in May 2012 to finance a pivot to mobile. The company has always focused on female first games, beginning by focusing on animal care based games on Facebook – Happy Aquarium, Fish with Attitude – before eventually moving towards Fashion and now finally interior decorating. Covet Fashion was launched in 2013 and has remained within the Top 200 grossing since launch, although it has been in a slow and steady decline since Fall 2016. Design Home launched during this period and has remained within the Top 100 grossing since launch, despite having a smaller feature set compared to Covet Fashion. Delivering on these games, Crowdstar cemented itself as a top developer, catching the eyes of the bigger players on the App Store. As a result, Glu acquired controlling interest in Crowdstar just before the release of Design Home in 2016, mostly due to Glu’s decline in its licensed celebrity IP stardom style games – Kim Kardashian: Hollywood and Katy Perry Pop games some of the most notable. Glu’s network of players from its stardom game network was a strong cross-promotion platform for the Crowdstar games, which made it a clear better-than-the-sum-of-its-parts acquisition. 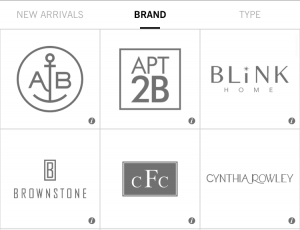 Crowdstar now has dominant control of the fashion and interior decorator network audience, alongside Glu’s strength in marketing, analytics, UA and live operations experience. Design Home’s core loop is straightforward. Players participate in timed Challenges that ask them to design spaces with certain requisites. Submit their Challenge and wait for other players to vote on it. Rewards are based on how well their creation was rated by the community. 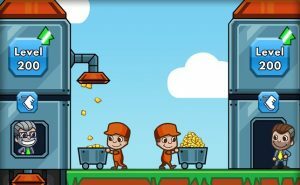 In order to start the next competition, the player needs to collect Keys. Keys are earned by voting on other player’s creations. Events can be from any location around the world, with vastly different requirements from one event to the next. Some events can be “key daily events”, while others can be included as part of wider, themed seasonal events. For example, the game has played host to an event for home improvement TV channel HGTV. As part of the tie up, players could enter “HGTV themed” competitions and have their respective scores tallied there. When a player has selected an event they want to take part in, they pay the entry fee – in this case, keys – and then start designing. After a player has selected their Challenge, they are given a short fictional brief before entering a room devoid of furniture and decorations. All but the Daily Challenges come with unique requirements, such as furniture of certain style or color. Each Challenge is a room filled with two kinds of ‘spots’: one spot where the player is required to fill with certain type of items, and a second spot ones where what they can place is optional. Player can’t change the colors of the wall or move the spots where items are placed, meaning play takes the form of a very simple placement puzzle that limits the creativity but also makes it easy for anyone to complete a Challenge. Players can place items they own as well as pieces that they don’t own. If a player doesn’t have the necessary items, they can purchase or borrow them on-the-spot to fulfill requirements or make the room come together. After all of the required items have been placed, player submits the Challenge for other players to review. Submitting the Challenge rewards player immediately with Coins and XP. It’s important to notice that once player has submitted their Challenge, they also lose the ability to use those items in other challenges until the submitted Challenge is over. This forces player to have bigger collections and multiples of the same item. After a player has completed their Challenge, they receive a Cash and XP reward. However, this is just the base reward. They need to wait for all other players to vote on their creation to get a final rating. After the voting time is over, a player also receives a bonus reward based on how their design was perceived by the community. The verdict comes in form of a five star rating and if a player exceeds four stars, they will receive a piece of furniture as a reward. Pacing in Design Home is handled partially through Keys – Keys that, quite literally, unlock events. Each time a player votes for a few other player’s designs, they are given keys, with five votes awarding three keys. In practice that means a player needs to vote on 45 different designs in order to enter a Challenge. This forces players to not only be a part of the design creation, but also encourages them to constantly vote and legitimize the ratings they receive. Besides keys, players are also paced by their collection of furniture. Each piece of furniture they purchase has a limit of one to three pieces, so players with smaller collections can’t enter in as many competitions. Also players are incentivized to have a wider collection of pieces, since using up all your best furniture in one event is not wise. 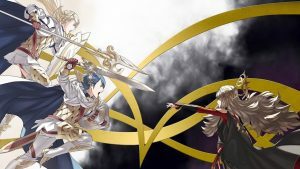 The first key reason for Design Home’s success is the way that their core gameplay is wrapped around constantly changing events. This is a design that’s now being replicated outside of Crowdstar’s lineup. 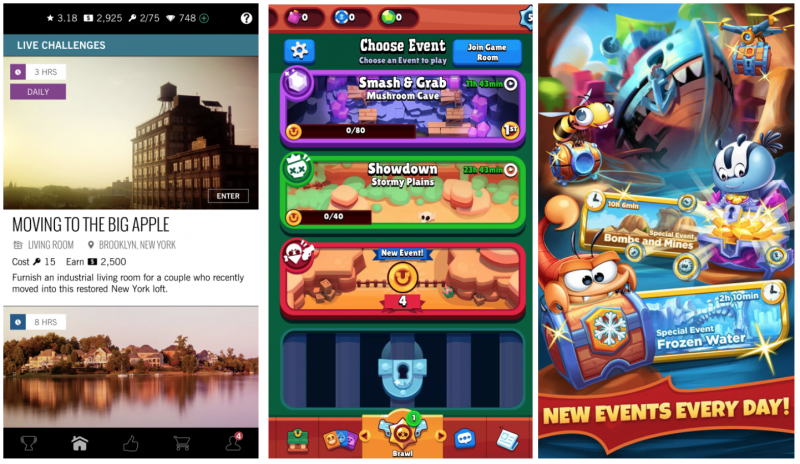 Finnish giant Supercell used a similar design in Brawl Stars, while Seriously used a similar design in their upcoming game Best Fiends Rivals. Like Crowdstar, they’ve all realised it’s a great way to create a constantly changing core. Design Home doesn’t follow a lot of recent trends in monetization. It doesn’t have gacha, it doesn’t use a lot of timers, it doesn’t even allow players to skip the voting timers to get their rewards early. So, just how does it succeed? Crowdstar monetizes from two key systems; slowly pushing players to care about their overall rating, and creating an emotional connection to what you’re creating. As a result, they monetize like no one else does. The base of monetization in Design Home is the slowing of progress – specifically the overall score of the players’ accounts. After each event, your voting results impact what your account’s overall score is. In short, to increase your score, you need to get great results. 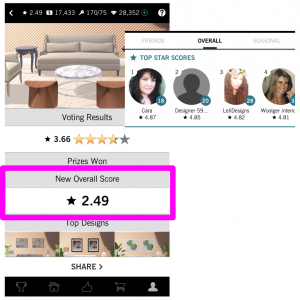 Design Home’s rating algorithm is set up in a way such that the voting results ratings typically fall between 3.0 and 5.0 rating. Getting lower than 3.5 rating seems to be a very rare occurrence. To begin with, your account’s overall score is 2.0. So, as a player first joins, each result from voting is guaranteed to make major progress to their review score. When a player reaches a 3.5+ rating, this progress significantly slows down. In order to reach a 4+ rating they need to be consistently getting a voter rating of over 4. This requires a large collection of furniture alongside a sense of what will rate highest in a given event. As a player hits this 4+ tipping point, their progress significantly slows once more and the easiest way to make progress is to buy the newest, best valued furniture & equipment. 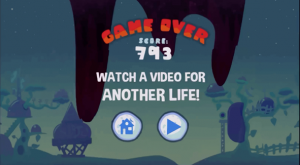 In short, Crowdstar has created a system where players actively care about their overall score, and so only want to submit designs that will increase it. As a result, the second major monetization point comes from the just-in-time purchasing of items and emotional connection. On this emotional score, each player lives out the fantasy of being a Interior Decorator in play. When decorating a room, the motivation stems from creating the space they envision will win the competition. However, especially early in the game, they have very limited access to the most desirable furniture. This is where the “just-in-time” purchasing is impactful. Players can preview how amazing a new piece of furniture would look in their design, and purchasing with Cash or Diamonds is just a quick tap away. As the player progresses, inevitably they will need to grind for major resources. Cash and Diamonds will become strapped as they progress due to how expensive the furniture is and how low each competition pays out. So over time, players will have to decide if they grind events by putting any possible furniture into it – wait a long time for their furniture to return to their collection – or spend. Crowdstar really preys on the player’s internal drive to create only great things. No one wants to feel like they are submitting a design to a social competition that is sub par, especially when your Facebook profile associated with it. The key learning here is, players are willing to spend both to maximize their chance of a high rating and because no one likes submitting something that they aren’t proud of. By combining these two systems, Crowdstar has created the perfect storm – it’s whipped up a great way to monetize off players purchasing decorations directly, which is a system that no other developer in the top grossing uses to this degree. Lastly, what key aspect I believe that drove the success of Covet Fashion and Design Home is that these games aren’t designed to look like a usual cutesy free to play game – they are styled like a professionally designed app. If you look at many of the Fashion Styling and Interior Decorating games created before it, they all resembled over the top pink, cartoony, and pretty gaudy color selection. Design Home’s look and feel is closer to a furniture magazine or professional software for interior decorating compared to a game. This both reinforces the fantasy and I believe strikes a chord with the audience – it’s a game for mature designers, not for kids. Of course what really ties this all together is the use of brands within the game it’s a win-win situation for both Crowdstar and the brands involved. 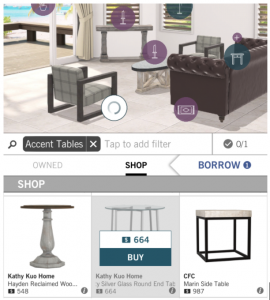 Design Home is seen as a professional designing game by the game’s audience – a game where players get to place real furniture that they could feasibly buy in real life, and can even within the app. 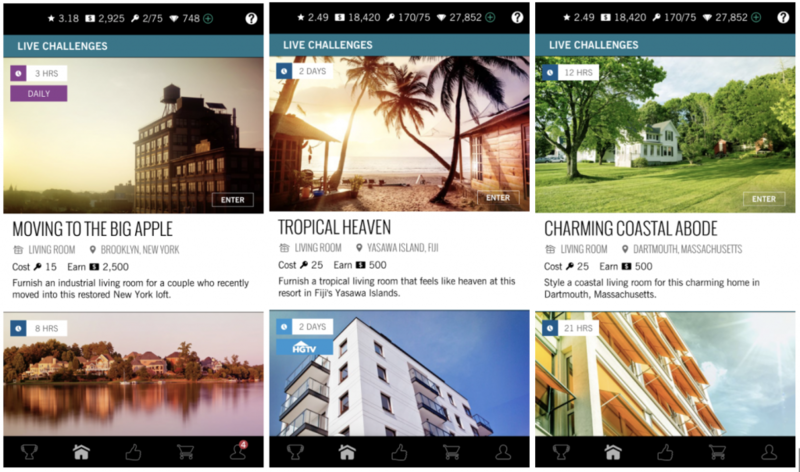 On top of this, brands get exposure within the app to their target audience: people that love designer furniture. 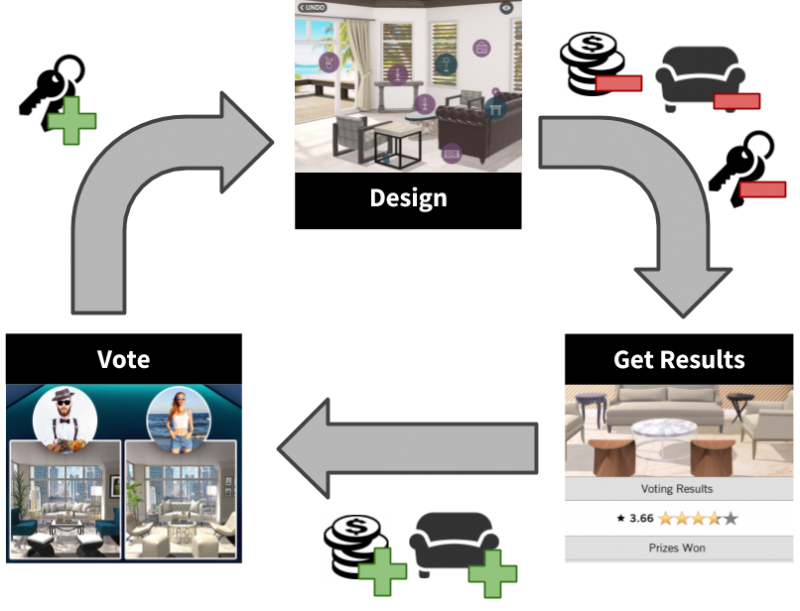 Brands like HGTV sponsor events, furniture brands can pay Crowdstar to increase the sorting rank of the furniture they put in game. Brands can even pay Crowdstar to have “brand exclusive” events — ex. one where only “Blink Home” furniture is allowed. 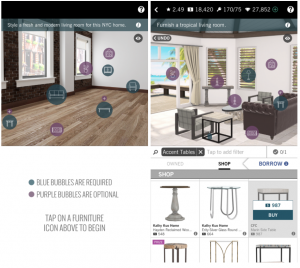 Design Home and Covet Fashion before it are key games for Glu + Crowdstar. 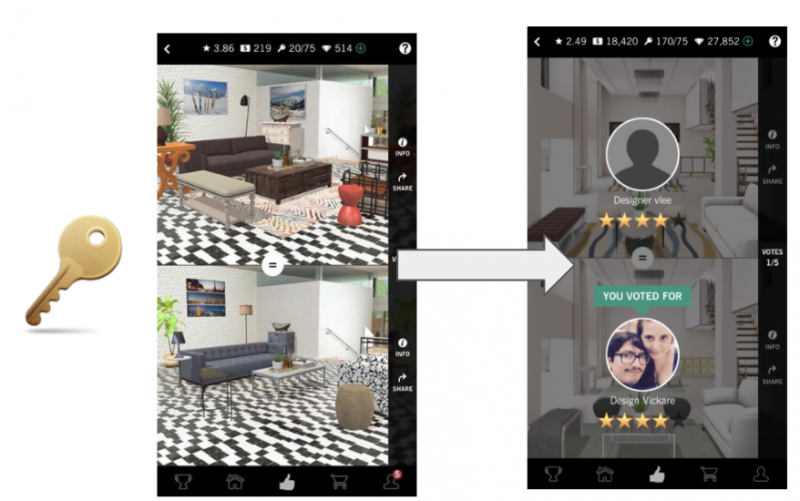 The company has created a successful hybrid of a social network and a game, and delivered a competitive PvP environment for a traditionally competition-lite market – fashion and interior decorating. It creates strong long term retention and plenty of outlets for Crowdstar + Glu to build upon for the years to come.